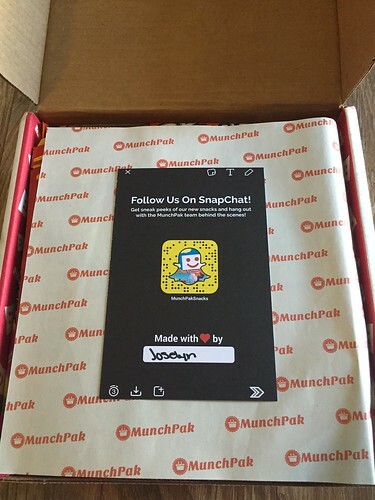 You can customize your MunchPak with a variety of snack options such as Spicy, Chips, Gummy, Sweet, and Crunchy which you can select as preferred or non-preferred. Subscriptions start at just $9.95. *This box was sent to SciFiChick.com for review purposes. Atori Biscuit Sticks (Retail $2.00) – These are labeled as “spicy” but they really aren’t. They are salty and delicious though. I’d definitely go for more of these. 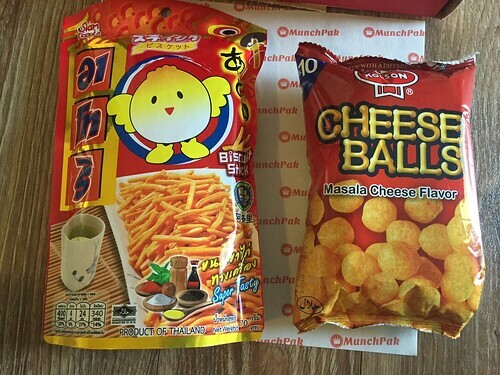 Kolson Cheese Balls, Masala Flavor (Retail $1.00) – I LOVE cheese puffs, but these are quite spicy and may be a bit much for me. 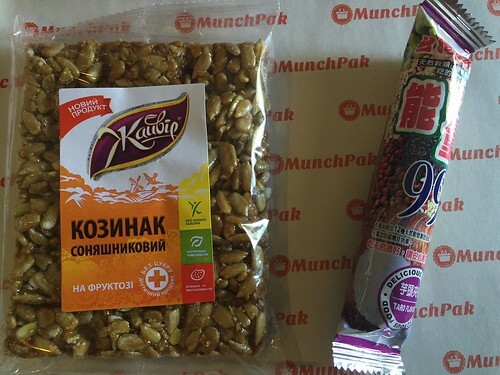 Kozinaki Sunflower Seed Snack Bar (Retail $2.00) – I took a small bite of this, but it’s pretty bland for the amount of calories listed. I may offer it to a family member. 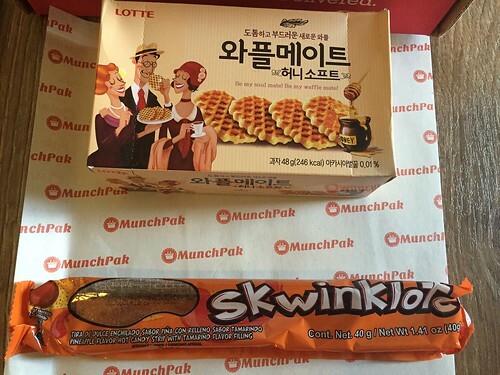 Lotte Waffles (Retail $2.00) – These are a cookie-like texture rather than the soft, European kind. But the flavor is still great! Lucas Skwinklote Spicy Candy (Retail $2.00) – This pineapple “flavored hot candy strip with tamarind filling” sounds intriguing. 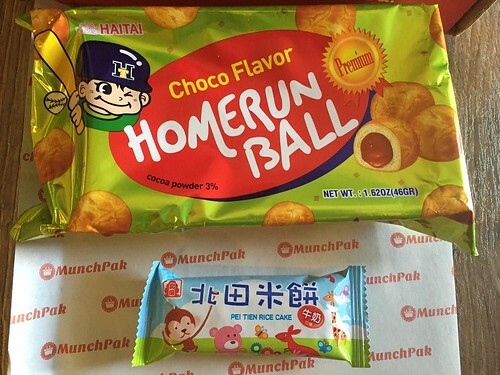 Homerun Ball Choco Flavor (Retail $3.00) – These are little pastry puffs with just a little bit of chocolate filling. Nothing like the picture. They’re still good, but not as tasty as they could be with a bit more filling. Pei Tien Bibi Bear Rice Cake Milk Flavor (Retail $1.00) – Rice cakes aren’t my favorite, so I may offer this around the office. Pei Tien Corn Roll (French Thick Corn Soup) (Retail $1.00) – This is like a giant puff ball (in the shape of a stick) that taste exactly like buttered corn! Really weird, but surprisingly good. Pelon Pelonetes Tamarindo Original Candy (Retail $2.00) – These are surprisingly tasty little candies. I’m sure my niece may swipe them. Wonderful Roasted and Salted Whole Pistachios (Retail $3.00) – I LOVE pistachios. And I’ve bought this brand several times. I inhaled these immediately. I only wish the bag was larger! 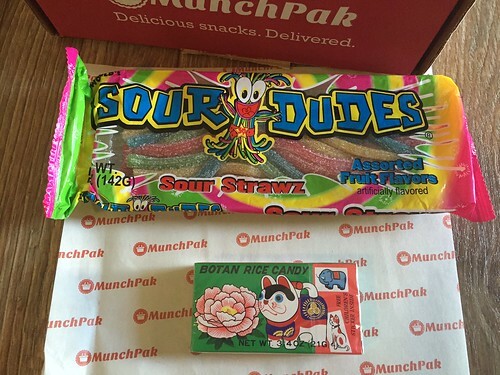 Worlds Sour Dudes Sour Strawz Assorted Fruit Flavors (Retail $3.00) – These are some of the best sour straws I’ve ever had! Not too sour and plenty of sweet! I’d definitely buy more of these. Botan Rice Candy (Retail $2.00) – “Soft, chewy, slightly lemon-orange flavored candy with an outer layer of rice paper. The rice paper is clear and plastic-like when dry, but it is edible and dissolves in the mouth.” These look like individually wrapped candies. And the rice paper does look like plastic. I’m not sure I’m brave enough to stick the whole thing in my mouth when it looks like a plastic wrapper. Summary: Joselyn is a pro at packing! I could NOT get all of these snacks to fit back in this large box! There were 13 snacks (several of them with fairly large packaging) that came to a total value of about $25. So the value comes to just over the cost of the box which is great, especially when you consider the world-wide curation. The variety of items was really impressive: sweet, spicy, salty, sour, and nutty. 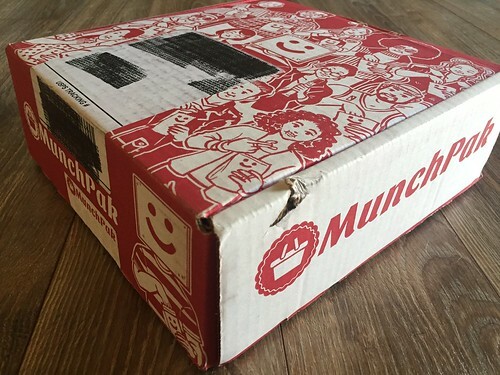 I love trying out different snacks, and this was a really fun box with something for everyone. And the option to customize is fantastic as well. 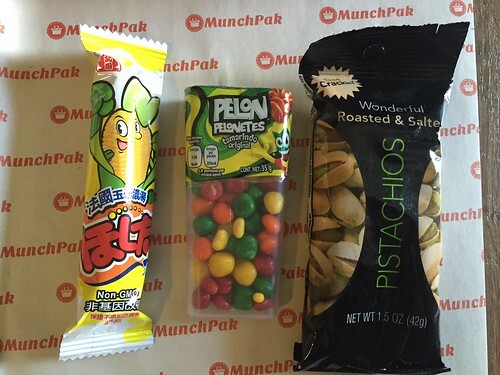 The snack scanner app is a great idea to add things to your “favorites” list or order more.